he Sunday Magazine was another of Alexander Strahan’s Evangelical journals and was intended as a complement to Good Words and The Argosy. Established in 1864 and published until 1905, it contains the usual blend of moralizing poems and articles about self-improvement and the exercise of virtue; it also features miscellaneous literature in the form of short stories and serialized novels. Sold weekly at sixpence and printed on good quality paper with glazed leaves for some of the illustrations, it was projected as a journal to entertain and instruct; designed to be read on the Sabbath, and pitched at a level that allowed it to be read by the middle-classes and their servants, it combined ‘improving’ material with some decent literature. As in the case of Good Words, its effects were buttressed by the inclusion of bold wood-engravings in black and white. Artists included Robert Barnes, Edward Hughes and George Pinwell, as well as contributions by Frederick Walker and Arthur Boyd Houghton. The first and most important editor was the Scottish preacher and philanthropist, Thomas Guthrie (1803–73), who guided the magazine through its first decade. Guthrie, a minister in the Free Church of Scotland, was an ideal choice for Strahan’s project: an able orator and philanthropist, he understood the importance of illustration as a means of reinforcing the moralities explored in the letterpress, and presented the pages of The Sunday Magazine as a balance of image and word. uthrie’s approach, if moralistic, is far from unsophisticated or overbearing. As in The British Workman, the stories are centrally concerned with the exploration of small lives as the characters engage with everyday problems, and there are few pieties. The illustrations are similarly pragmatic; unusual for their depiction of poverty, they focus on the need for a common humanity rather than religious belief. This message is principally framed in a series of images in which working-class life is represented with insight and understanding while also showing bourgeois characters in their social relationships with the poor. The effect is anything but patronising or sentimental, and the best illustrations are both journalistic and highly nuanced. Privation and suffering is a theme, although many of the illustrations are celebratory and depict the more positive aspects of ‘the working-class experience’, an approach that bears interesting comparison with the writing of Elizabeth Gaskell in Mary Barton (1848), North and South (1855), Sylvia’s Lovers (1863), and Ruth (1853). Pinwell depicts several scenes in which the two classes are brought together in a shared sense of purpose and identity. 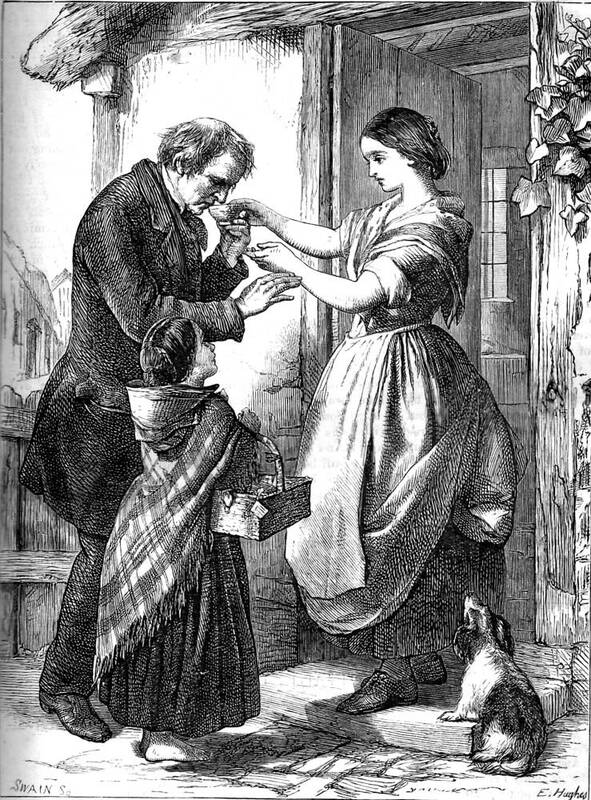 One of these, an illustration to an anonymous invocation to visit ‘Poverty’s dwelling’ (1866, facing p.104), is typical in its emphasis on communication. It shows a middle-class visitor talking to an elderly woman, while two children look on. The contrast between the classes is sharply noted in the differences of dress and demeanour, but more important is the characters’ unspoken rapport; the two women’s stance, with down-cast eyes, implies a shared modesty and shyness, and (unusually for Pinwell) there is no sense of an emotional distance between them. The condition of the poor is similarly noted, usually as a subject in its own right, in illustrations by Robert Barnes and Edward Hughes. Both artists are sympathetic to their subjects. Like Alfred Walter Bayes, Barnes was of humble origin and has an insider’s view of poverty. He is especially effective in his representation of family groups and cottage interiors, and conveys a distinct notion of the dignity of the labouring classes while never resorting to idealization or sentimentality. 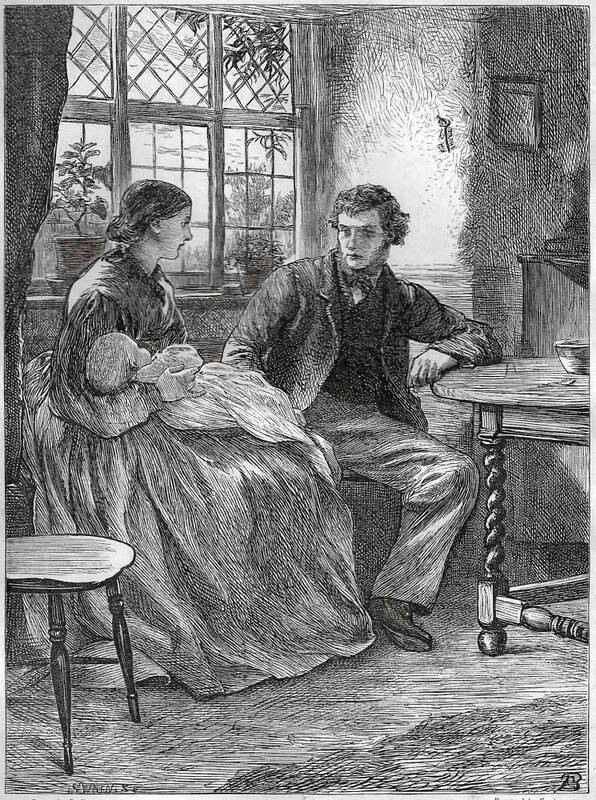 In ‘The Pitman and his Wife’ (1866, facing p.17), he shows the Pitman uneasily telling his wife of his religious doubts: a moment with a genuine sense of crisis. Indeed, these are characters of convincing depth; anything but stereotypes, they present the contemporary viewer with a version of working-class life which insists that even the poor have emotions. Images of feeling, both joyous and despairing, are also characteristic of Hughes’s contributions. 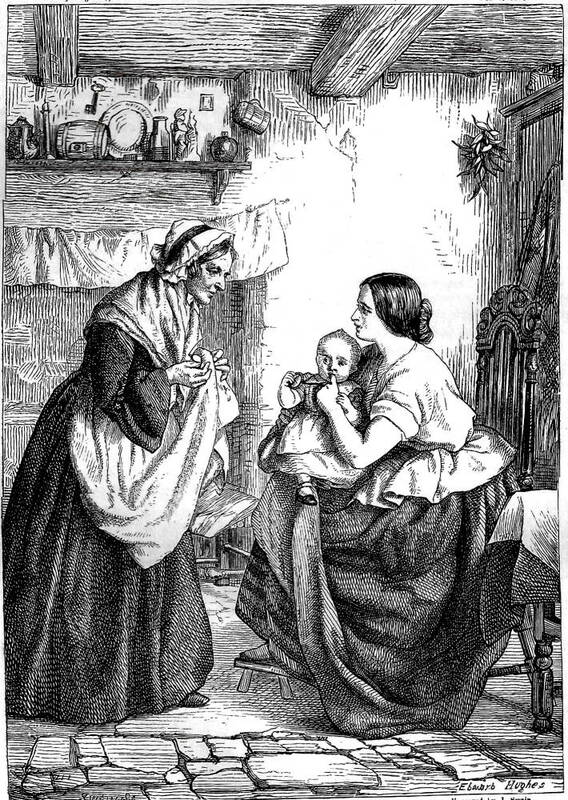 ‘The First Tooth’ (1866, facing p. 337) is a well-observed and so is ‘Under a Cottage Roof’ (1866, facing p. 192). These are sympathetic depictions of everyday lives; free from moralizing, as such, their charting of material poverty is in calculated contrast to the spiritual wealth of a people who are (supposedly) generous – and enriched by their continuing goodness. Usually regarded as a minor artist and omitted in Goldman’s study of the period, Hughes makes a significant contribution to the magazine’s pages, focusing some of its central messages. That message is essentially one of love, toleration and reconciliation – the conventional response of mid-Victorian Evangelicalism to the continuing problem of poverty and class antagonism. However, some of the images depict proletarian life in the raw. Pinwell, noted for his outspokenness in his depiction of suffering, is at the forefront of this tendency. His most telling design is ‘The Gang Children’ (1868, p. 25), an illustration to accompany an anonymous poem. The verse is quietly condemnatory, noting how the children, who work the fields at the age of eight, are neither ‘merry nor wise’; as the writer comments with heavy irony, ‘labour is such a boon’ (for those reaping the profit) that it would be a ‘sin’ to ‘play’. In Pinwell’s design, on the other hand, there is no ironic understatement; the artist shows the children as morose and tired, with unsmiling faces and a tired demeanour, and the effect is implicitly one of anger directed towards the unseen ‘employers’, rather than compassion for the victims. Produced at the end of the 1860s, the image prefigures the unequivocal honesty and directness of the social realism of the 1870s, notably anticipating the work of Luke Fildes, Hubert Herkomer, and others working in the style associated with The Graphic. The Sunday Magazine might thus be viewed as an interesting representation of middle-class attitudes towards the poor. The images of social unity are placed next to those that show privation with absolute directness: an effect Guthrie must surely have intended. How readers responded is of course impossible to know; but the magazine may have played some part in raising awareness and in promoting a notion of sharing and compassion, even if the idea of equality is never on the same agenda. Like Gaskell, Dickens, and practically every social commentator of the period, the editor, writers and artists present the audience with some hard truths while never suggesting a political solution. At once radical and conservative, The Sunday Magazine exemplifies the contradictions of its time. Dictionary of Nineteenth Century Journalism.Ed. Laura Brake. Gent: Academia Press, 2009. Sunday Magazine, The. London: Strahan, 1866–70.